Again, make a copy of the project you've already created. Just as a precaution, so you can go back to what you've done previously. You also should have completed part 1, part 2, part 3, and part 4 to do this tutorial. In this tutorial, we'll add some Command Menus which open up other applications on the Pre/Pixi. In this specific case, we'll open up the Calculator app as well as the E-mail app. We'll even pass some data to the E-mail message. Let's first take a look at the Command Menu section: The this.cmdMenuModel statement creates the menu with the appropriate parameters. What's interesting is the label: items. You'll notice I have a bunch with comments. These show the various icons that can be used instead of lettering for Command Menus. While they may not be appropriate for this application, I've included them so that you can see them by removing the comments for the one you want to see. Keep in mind you'll want to comment the previously uncommented line. The command: section in the item: parameter tells the program what to execute when one of the Command Menu buttons is pressed. In our case, we have openEmail and openCalculator to open the appropriate utility. Now, we'll look at the event handler for when the Command Menu buttons are pressed: The FirstAssistant.prototype.handleCommand is responsible for reacting to the Command Menu button press. We'll use a case statement to determine which specific button was pressed. Then, the this.controller.serviceRequest is used to open external applications using the Palm Application Manager. The important part of this is the id: field, which identifies what external app to open. What's interesting is that the e-mail app can have parameters passed to it, such as summary: (which adds a Subject to the message) and text: (which adds the message text) to put useful information into the message. Note: In order to see this, either in the Emulator or your device, you have to first configure the E-Mail application with the account info beforehand. 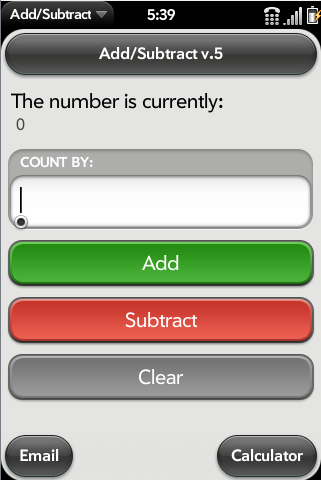 Even though the app really isn't all that useful, it is starting to look like a real WebOS app! More information about Command Menus can be found here. For more information about WebOS services, go here.